180 AWPA Members, prospective members, guests and their spouses attended the 2019 Annual Meeting in Clearwater Beach, Florida. The weather was fantastic, and the program was great, too! 62 Operations Personnel from across the country met in Indianapolis for this year’s Operations Managers meeting. 100 attendees met in Washington, DC to hear the latest on international trade, tariffs, and the mid-term elections. More than 150 attendees met in Palm Springs to discuss the latest economic and trade issues. 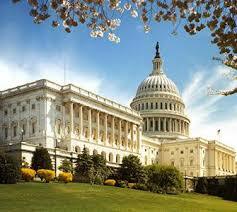 More than 100 attendees met in Alexandria, VA at this year’s Government Affairs Conference. 34 Member Company Representatives went on 73 visits to Congressional Offices, and a Wire & Wire Products Caucus Briefing was held on Capitol Hill. Ken Simonson of the Associated General Contractors of America spoke at this year’s Breakfast. Thank you to Nucor for sponsoring this event. Over 200 members and guests met in Napa, CA for the 2017 Annual Meeting. Attendees heard presentations on the economy and the steel market, imports and trade, the political outlook, and how the Industrial Internet of Things is improving manufacturing. Materials from the meeting are below. 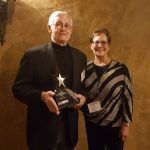 Stan Fossick received this year’s Max Moore Entrepreneurial Spirit Award from Pat Moore. The 2016 Operations Managers Meeting in Charlotte, North Carolina provided a workshop for Operations Managers and Personnel Managers to develop new plans for recruiting and retaining new employees, and integrating them into the existing workforce. The group toured HSM Solutions’ Hickory Springs facility. 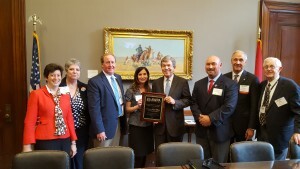 Presentation: Shira Harrington, Purposeful Hire, Inc.
AWPA Members present an award to Senator Roy Blunt for his efforts in passing the ENFORCE Act. R to L: Janet Kopenhaver, Kimberly Korbel, John T. Johnson, Amy DeArmond, Senator Roy Blunt, Robert McKinzie, Milton Magnus, III, and Stan Fossick. The 2016 Government Affairs Conference was held in Washington, DC June 6-8. More than 80 AWPA attendees joined over 500 participants in NAM’s Manufacturing Summit in promoting the manufacturing industry on Capitol Hill. Advocacy focused on Global Steel Overcapacity and China’s Non-market Economy Status, Regulatory Reform, and promoting the Wire & Wire Products Caucus. Below are materials from the meeting. The 2016 Annual Meeting was held February 22-24 in St. Petersburg, Florida. There were 182 attendees. Participants heard presentations on the economy, the scrap market, multi-generational workforce challenges, the wire rod market, and an update on the political outlook for the 2016 election. Below are materials from the meeting. Presentations from Steve Murphy (Steel Market Update) and Joe Ward (Scrap Market Outlook) will not be available. The 2015 Government Affairs Conference was held September 16-18 in Washington, DC. There were 114 attendees, the largest group at this meeting since 2000. 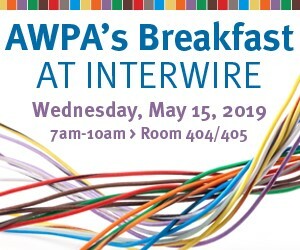 43 AWPA members made 87 visits to lawmakers on Capitol Hill, to discuss ENFORCE, the US House Wire & Wire Products Caucus, and the latest developments at the National Labor Relations Board. Below are materials from the meeting. The 2015 Operations Managers Meeting was held in Nashville, Tennessee. Plant managers, safety and environmental personnel, human resource managers, and industry suppliers met to discuss employment issues, upcoming regulations, and hazard identification challenges. The AWPA would like to thank Sumiden Wire Products Corporation and Mid-South Wire Company for opening their facilities to our group for tours. Below are materials from the meeting.